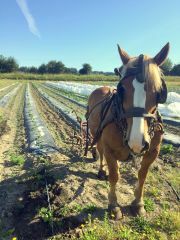 As Aaron and Jesse Nichols walked me through the greenhouse, past their horses, and into the rows of veggies patiently waiting for drier days, I thought to myself how very seasoned these two men seemed. With ease, they described everything from the greenhouse that Jesse is currently building for potatoes and melons, to the small piece of land managed by the USDA’s Natural Resources Conservation Service, which over a thirty year period will replace the invasive reed canary grass with a native plant species. 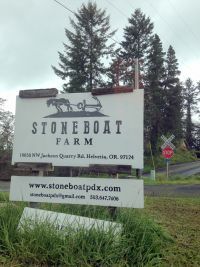 Aaron and Jesse are actually only in their third year, though, on the thirty acres that they have named Stoneboat Farm in Hillsboro, Oregon. Using both horse power and tractor power, they call themselves a mixed-powered farm, and their adored Belgian draft horses, Esther and Gale, have been with them since the start. Born and raised in Portland, Aaron and Jesse came to create Stoneboat after each pursuing agriculture in his own way. While Aaron lived for four years in New York, farming upstate and cooking in renowned New York City restaurants such as Franny’s and Eleven Madison Park, Jesse served as an AmeriCorps member for Adelante Mujeres, a nonprofit devoted to empowering the low income Latino community of Oregon’s Washington County. After renting land in Gales Creek while they searched for the perfect spot for their farm, the brothers found Stoneboat while it was still a conventional tree nursery. Despite the work that came with transitioning this land into an organic vegetable and poultry farm, the nursery left them with a durable irrigation system that now serves their soil well. The farm is not USDA Organic just yet (this takes time and is costly), but nonetheless, it has already made its mark in Portland. Stoneboat features a growing winter and summer CSA (Community Supported Agriculture), works with many of Portland’s most renowned restaurants, and also supplies produce to Hot Winter Hot Sauce and City Market’s Raw Raw Produce. They have even made and sold their own Stoneboat hot sauce in the past. To top it off, Aaron and Jesse also operate stands at the Hollywood and Orenco Station farmers markets. With two full-time employees in addition to themselves, three part-time employees, Esther and Gale, and one small tractor, Stoneboat’s production is noteworthy. In addition to the farm’s incredible diversity–ranging from funky greens and beets in the winter to Heritage and broad-breasted turkeys just in time for Thanksgiving–Stoneboat also stands out for the community that it seeks to incorporate. In 2014, Jesse harnessed his connections with Adelante Mujeres to create CAMPO, an internship program that brought students from the organization’s Sustainable Agriculture division to work at Stoneboat while also gaining the experience necessary to start their own organic farms. Although Adelante is not currently funding CAMPO, Jesse is at the beginning stages of founding his own nonprofit. His organization, he tells me, would work similarly to CAMPO but also include a language program for American college students to learn Spanish. A current graduate student of Spanish at Portland State University, Jesse seems most excited by the possibility of bringing these two communities together. In a county where Latinos make up more than 16 percent of the population and at a time in which the lives of Latino migrant workers are perhaps more endangered than ever, Jesse’s ambition to integrate the worlds of small-scale farming and social justice is invaluable. As Aaron and Jesse spoke with me as we stood admiring their 100 baby Heritage chickens, I could not help noticing the composure of these two new farmers. When I asked them to talk about some of the challenges that they have faced beginning Stoneboat, I expected stories of a tough first planting season or about transitioning the nursery. After a moment of pause, though, stumped for an answer, Aaron and Jesse laughed as they agreed that hauling a bunch of turkeys in their truck when they first arrived still stands out as a major struggle. “Oh, and the wet weather,” Aaron added. Moving turkeys around and the relentless Oregon rain have been their biggest setbacks…I was impressed. Set against a sea of forest green and lumbering clouds, where the loudest noise for miles is the barking of the Nichols’ dogs as CSA shareholders come to collect their bounty, Stoneboat holds all of the beauty and coziness of a Pacific Northwest farm. When you take this fertile land and combine it with siblings who have brought together their shared love for food and agriculture in pursuit of a project far larger than themselves, Stoneboat proves to be something much more than your standard Oregon farm. I am excited for all that is to come for Aaron and Jesse and for the other young, bright farmers out there. Right before I left Stoneboat, I ran into Aaron’s son Asa, playing in front of the house with his grandmother. The brothers stopped quickly to entertain him, said goodbye to me, and then went on to continue with their work day. All at once, I was overcome by a deep sense of admiration for the life that these men have built in this tranquil space, knowing that they are only just beginning.